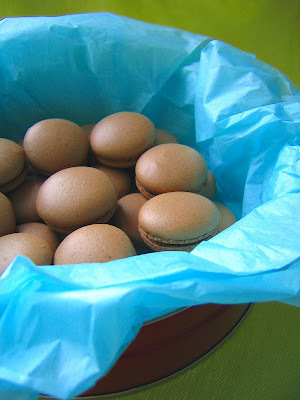 For anyone counting, this is the fourth photo of macarons that I have posted on my blog since its inception seven months ago, a reflection of how enormously I love them. The key difference between these and previous macarons, however, is that these little beauties are homemade by yours truly. This recipe is from Alain Ducasse's Grand Livre de Cuisine: Desserts & Pastries and despite not having a convection oven at home, they turned out exquisitely. One of my last assignments at the Pan Pacific was to make macarons and because of my surprising success in producing macarons beyond everyone's expectations, I was requested to make almost 700 for several functions. These macarons are filled with a chocolate-passionfruit ganache, customized for my friend Ramona who just gave birth to a healthy baby boy on Friday. It is my theory that the passionfruit bubble tea which she consumed earlier provoked the subsequent labour and delivery. Combined with the undeniable fact that she is one of the biggest chocoholics who I know, these macarons are a perfect sweet treat for her. Posted by Charmaine at 2:42 p.m.